The Driver and Vehicle Standards Agency (DVSA) made changes to the theory test on January 2012. The theory test will include new multiple choice questions. 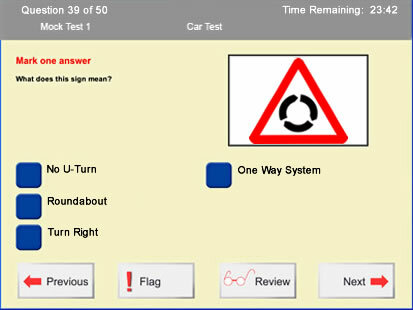 Currently you are able to purchase materials that contain all the official theory test questions and answers that allow you to study before sitting the theory test. The DVSA are not allowing anyone to publish the new theory test questions and answers from January 2012. The DVSA will however continue to publish an official DVSA theory test revision publication. Will the new theory test in January be more difficult? The theory test itself will remain pretty much the same other than the questions will be changed. It may become more difficult however due to the exact questions and answers not being published in either book format or on web sites. The official DVSA publication will provide information, essentially extending on the Highway Code, rather than the actual questions and answers. DVSA publications will provide the same amount of revision questions and answers, but instead of being the exact questions and answers found in previous publications, they will be very similar to those found in the new theory test. Instead of a basic answer to the question, there will be full explanations given. Why Did the DVSA making this theory test change? Many learner drivers when studying for the theory test learn by rote, and by doing this only short-term memory is often used (see below for a further explanation). To discourage this, the DVSA are placing more emphasis on an understanding of the meaning of driving theory. The DVSA state that removing the theory test questions and answers will allow test candidates to gain the knowledge and understanding on becoming a safe driver instead of simply memorising the answers. Instead, questions and answers very similar to those found in the actual test are provided, along with full explanations of the answers. How can I revise for the new theory test? New publications are released each year along with the official DVSA version. New publications will emphasize the meaning of a rule for example, rather than just giving an answer. The official DVSA publication will include “knowledge and understanding” text, which offers explanations of the answers. Essentially, a complete understanding of the Highway Code will provide you with all the answers you will need to pass the theory test in January 2012. Taking professional driving lessons from a driving instructor will significantly help with passing the new theory test as your instructor will offer valuable information and understanding for the theory element of driving. The multiple choice part of the theory test will remain the same as it is currently with 50 possible questions and a pass mark of 43. The questions will however be changed. The hazard perception part of the theory test will also remain the same with 14 video clips being shown. The scoring system of the hazard perception will also remain the same as detailed in tips on passing the car theory test. The theory test for cars changing to 100 questions is currently a rumour. Although the theory test has changed earlier this year, the current theory test still involves 50 multiple choice questions. The new theory test will essentially remain the same other than the multiple choice questions changing. Studying for the new theory test will have an emphasis on understanding the rules of the road other than simply knowing an answer. The DVSA state that this should provide an in-depth knowledge of road safety, typically among younger drivers. Theory test revision will require a more thorough understanding of the answers as full explanations of answers will be given in all new theory test publications. Learning by rote is a learning technique by use of repetition. Rote learning is typically used when a situation requires quick memorisation such as trying to remember a number for example. Rote learning can be deemed ineffective because although you may know the answer to a question, you may not know the actual meaning why that is the answer. It is effortless to remember your favorite scene from a movie for example, but remembering meaningless data is often confined to short-term memory.